The Thunderbolt 3 cable provides you a more enjoyable life with more speed on data transmission; more pixels on video streaming; more power on charging; and more protocols can be communicated with through this compact port that does it all. A single cable provides 2x the video bandwidth up to 40 Gbps and 8 lanes of DisplayPort 1.2 to support dual full 4K @60 Hz displays or connect a 5K display when connected with compatible systems and Thunderbolt 3 accessories. Can daisy chain up to 6 devices directly to a Thunderbolt 3 equipped computer and support Thunderbolt peer-to-peer 10Gbit networking for sharing devices. 1 * 2M/6.5FT CHOETECH Thunderbolt 3 Active Cable, 30-Day return for any reason, 18-Month warranty for quality-related issues, Lifetime technical support & Friendly Customer Service. 1.For the specification of Intel Thunderbolt, Active TBT3 cable doesn't support native DP alternate mode and USB3.1 Gen1 & Gen2 mode. 2.Only compatible with Thunderbolt 3 Devices. 3.Dual-protocol support for TBT mode (PCI Express and DisplayPort) and can be used for Thunderbolt daisy-chaining devices. 4.Compliant with USB Power Delivery Specification Rev2.0. Maximum power delivery capacity up to 5A. 【Thunderbolt Certified】This Thunderbolt 3 active cable has been tested to abide by the Thunderbolt standards provided by Intel regarding durability and sustained functionality. And it is fully Thunderbolt 3 compatible. 【40Gbps Data Transfer】The Thunderbolt 3 cable can transfer data at up to a staggering speed of 40 Gbps between twoThunderbolt devices. Let you connect to Thunderbolt 3 port to deliver video and data to your Thunderbolt devices. 【100W Charging】Deliver up to 100W (5A/ 20V) of power delivery to charge your laptop. 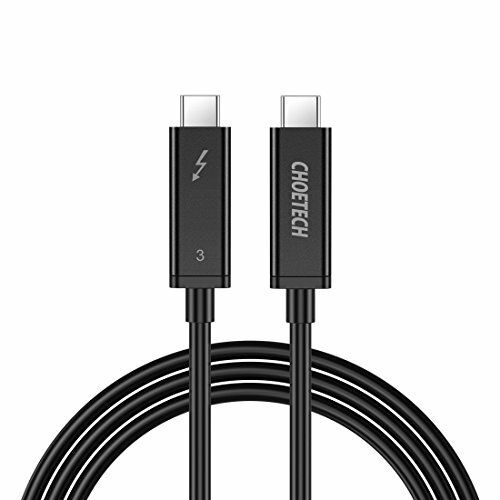 And safely power and charge only your Thunderbolt 3 devices with this certified cable. 【Support a 5K UHD Display】Support dual full 4K @60 Hz displays or even a 5K display when used with compatible systems and Thunderbolt 3 accessories. Perfect for connecting displays with astonishing resolution, contrast and color depth to see your photos, videos, applications and text with amazing detail.